Time-of-use electricity pricing is a hot topic since Ontario's Auditor General wrote of the high costs of the smart meter implementation in the province. The defence of the program from Ontario’s Minister of Energy appears to be spreading disinformation about rates, and multiple sources are calling for a greater differential between “off-peak” pricing and “on-peak” pricing. 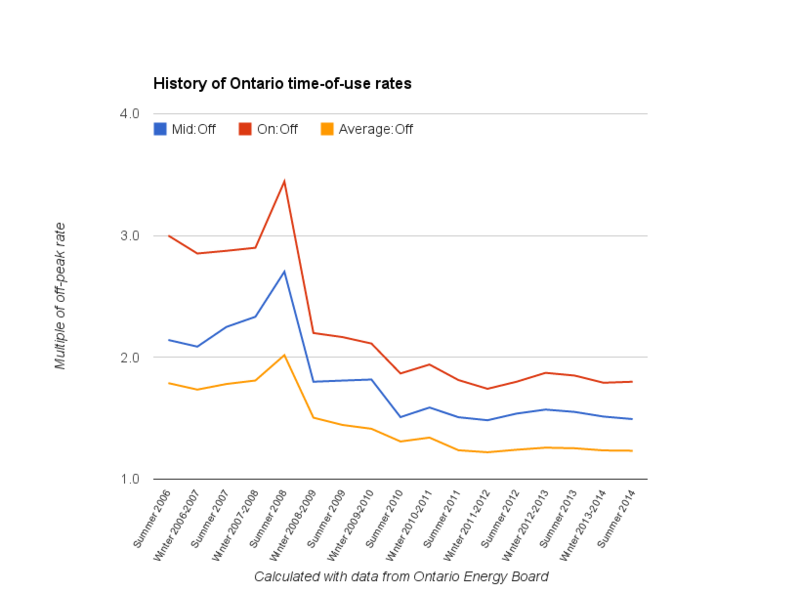 I'll review Ontario's time-of-use rate history, showing how the differential shrunk, and explaining why. 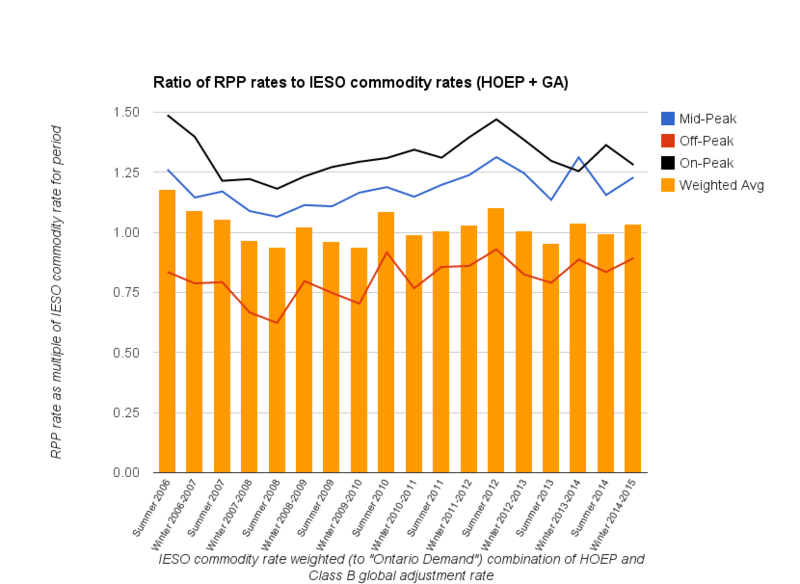 The analysis of time-of-use pricing in Ontario’s electricity sector displays the absurd disconnect between pricing and supply policy in the province, made even more absurd by political interference. “We did have a higher price for peak when we first introduced (time-of-use pricing) and there were a lot of consumer complaints about that...In response to consumers, we reduced the peak price and there was less of a differential and that created less of an opportunity to save more money on your electricity rates. There is some truth to the statement that the government responded to complaints about time-of-use, but they did so prior to 2011's election by regulating off-peak pricing to start at 7 pm - it was at 9 pm prior to the change. I've seen no indication that on-peak time-of-use (TOU) prices were ever deliberately lowered, aside from altering the hours on-peak pricing was applied. note: The Global Adjustment charges Ontario ratepayers for the difference between the total the system paid all generators, as per contracts and/or regulation, and the market value of that generation. Initially, the Board allocated global adjustment or “GA” costs uniformly on a per kilowatt-hour basis across all TOU supply. This allocation increased off-peak TOU prices proportionally more than on-peak prices, contributing to greater convergence between the three TOU pricing periods. The Board therefore determined that, commencing with prices set in the fall of 2009, the GA costs will be allocated to the TOU period when they are generated (in other words, GA costs associated with peak supply costs are recovered through peak TOU prices and similarly for off-peak and mid-peak supply costs and prices). how might the OEB, or anybody, determine what TOU period a "GA cost" is "generated"in, or for? There was no gentle period of convergence up to the "fall of 2009" - there was the fall of 2008 when the off-peak rate for the coming winter rate period was raised 48%. There wasn't a hint this would be happening in the early in 2008, when natural gas prices were spiking, but regulated price plan (RPP) pricing is set just in advance of the rate period, and the market price (HOEP) in the consultant's RPP reports indicate that between the spring of 2008 and the fall, with the economy deteriorating, the on-peak HOEP pricing forecast for the November 2008 - April 2009 period dropped from over $90/MWh to ~$60/MWh - while forecasting of the off-peak HOEP price for the period changed upwards, from ~$35 to ~$40/MWh. That bizarre market price forecasting determined the dramatic flattening in the RPP TOU pricing for the Winter 2008-09 rate period. The particular forecast that drastically altered the ratio of on-peak to off-peak rates (Winter 2008-09) did predict the coming trend in the global adjustment (GA). In the summer of 2008 it was at 10% of the total rate; in the summer of 2009 it has moved to ~%60, and by the summer of 2014 to nearly 80%. The data does support the premise that the higher the global adjustment, the lower the differentiation between on-peak and off-peak rates. The reduction of electricity demand during peak times was intended to delay the need to expand power-generating capacity in Ontario, along with the related costs. In the decade since the Ontario government announced Smart Metering, peak demand has remained essentially unchanged, but the Ministry has approved significant increases in new power generation, such as renewable energy, creating power surpluses in Ontario. The renewable energy is an important point I'll return to. The OEB claimed changes to how global adjustment (GA) costs are allocated, commencing for the Winter 2009-2010 RPP period. The market rates, calculated by RPP TOU periods, have never priced the variability between periods as extremely at the OEB's TOU rates have. Whatever change the OEB made to shifting GA costs for winter 2009-10 they were not meaningful, or were counteracted by changes to TOU hours. 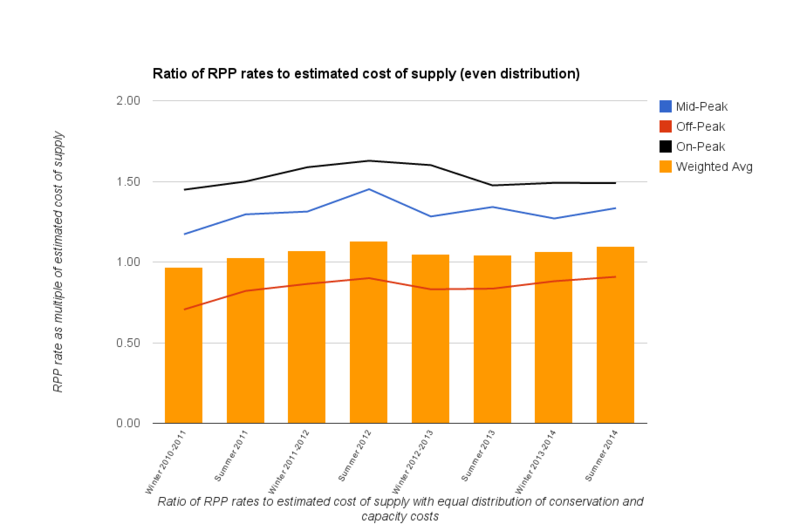 The desire to spend money reducing peak consumption among the regulated price plan (RPP) consumers appears to be driven by ideology, not economics. Perhaps figuring out how the RPP pricing is accounting for the global adjustment will make historical TOU pricing appear more rational. Ignoring the hourly composition of the global adjustment (GA) at all allows the relatively simple addition of the "class B" GA rate (weighted average) to the HOEP charted above. For comparison to the RPP TOU rates, I've stuck with showing the ratios of the OEB TOU pricing and my calculations for wholesale prices for the same rate times- calculated as the hourly HOEP plus the monthly global adjustment (class B). The initial TOU rates were set for relatively few consumers, with the hope a 3:2:1 ratio would work. Note that if the whole market were on TOU pricing in the first 5 seasons, the regulated price plan would been recovering a shrinking share of the the full costs of supply, bottoming out well below the cost of supply in the summer of 2008. The ratio moves above 1, indicating full recovery of supply costs, only with the steep 48% increase in the Off-Peak rate previously noted as being introduced for Winter 2009-2009. I suggest this need to increase recovery of costs is what caused the forecasting that resulted in the steep increase in off-peak rates, and therefore narrowing of the differential in TOU pricing, for the winter of 2008-09. The ratios are fairly consistent recently. The OEB's RPP manual claims the methodology changed in 2009: "GA costs will be allocated to the TOU period when they are generated" statement. This is a vague statement. Does it mean payments for conservation programs (such as coupons for purchasing LED lights) would be allocated only to on-peak rates? How about capacity payments, such as net revenue requirements (NRR), reliability must run (RMR) and the contingency payments coal-fired units received for years? What of the costs of curtailing supply, usually in off-peak hours - is that a cost of having the supply for peak? And, what of payments by unit output - we pay nuclear units the same at 3 am as at 5 pm, but is that how we value the output? I decided to hit the database to pull some figures that estimate the costs of supply by hour, grouped to the TOU periods by season. I've only collected production data by hour, by generator, since fall 2010, so the next few charts will be only from Winter 2010-11 to the Summer 2014 period. First, distributing all costs hourly, including conservation programs and capacity payments such as net revenue requirements, contingency and reliability must run agreements, the supply costs don't vary nearly as much as TOU rates suggest they should. I interpret this approach to have been the one the OEB claims "increased off-peak TOU prices proportionally more than on-peak prices, contributing to greater convergence," which they claimed to have replaced for winter 2009-10 (prior this chart's period). I'm not sure I see an indication the differential would have narrowed much over this period - which was a period of rising global adjustment charges. Regardless, using this approach the OEB rates are consistently higher in mid-peak and on-peak hours than indicated by evenly distributing supply costs, with the off-peak rate always below what the analysis dictates it should be. This method closely matches the OEB's Off-Peak pricing to the off-peak supply cost, and brings the variance in the on-peak pricing down to the level of the off-peak variance. The implications of this are that to increase the spread between Off-Peak and On-Peak pricing, it is requisite that the value of a watt from sources paid by the watt (hydro, wind, solar, and nuclear) be valued differently at different times of the day. This strikes me as requiring arbitrary judgements. 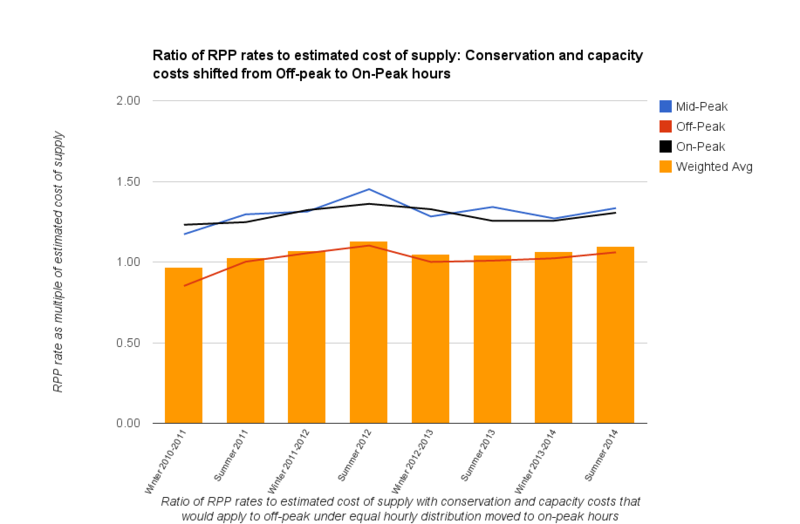 The removal of capacity costs from Off-Peak pricing is also arbitrary. When the costs of conservation programs have been evaluated they include reductions in all hours; and the only recent activation of a demand response program included 2 hours of OEB Off-Peak hours. If conservation is not charged to off-peak hours through rates, the effectiveness of conservation programs shouldn't include reductions in off-peak hours either. 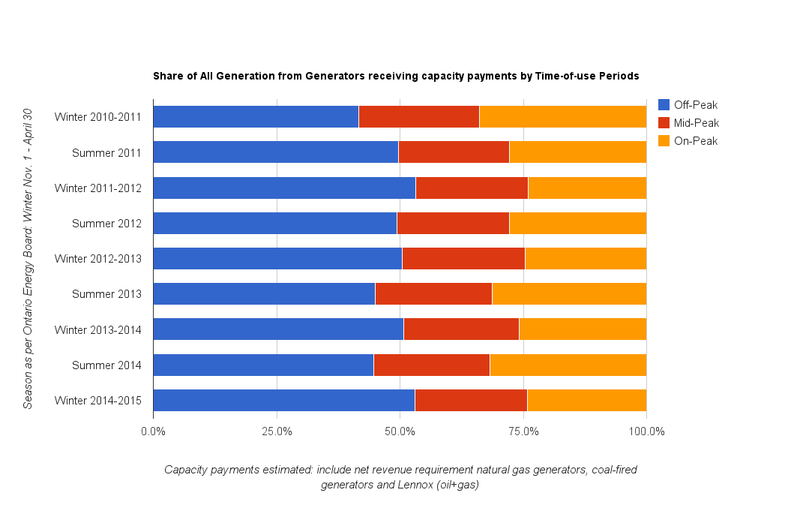 Similarly, generators paid for capacity generate more in Off-Peak periods than any other, particularly in the winter periods since Off-Peak billing was regulated to begin at 7 pm. It is simply not apparent that removing these costs from Off-Peak pricing is useful for rationalizing Ontario's electricity supply and demand. It is apparent that setting time-of-use hours is political. The regulation starting Off-Peak hours at 7 pm, effective May 1 (Summer) 2011pushed many of the highest demand hours into Off-Peak billing periods. During summer billing periods starting off-peak at 7 pm moved the incidence of very high demand hours occurring in off-peak billing periods up to about 23%. 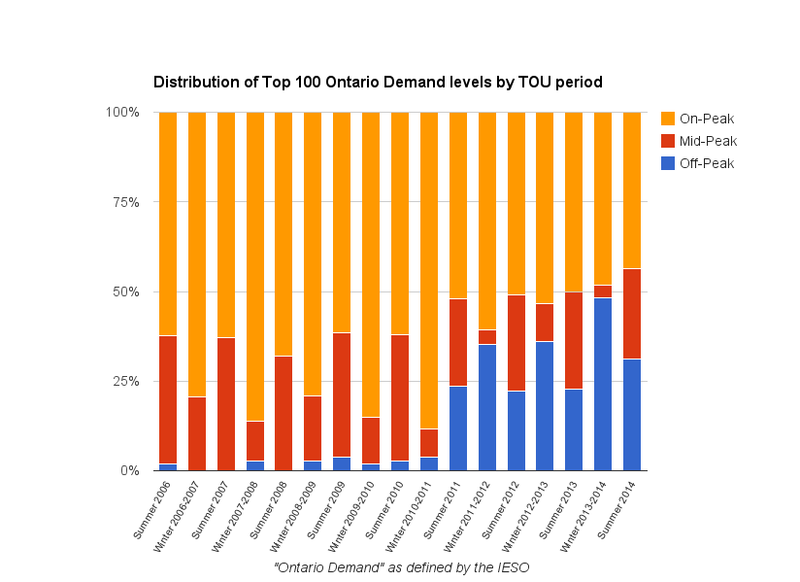 The incidence of peaks occurring during the warmest, on-peak, afternoon periods is likely also deteriorating because most solar panels in Ontario are getting constructed embedded in local distribution networks, which impacts IESO demand reporting by lowering demand. Were metering to be smart for residential and small business customers, it would facilitate responding to price and not time-of-day. Price measures the relationship between supply and demand. This is where the contracting of renewables alters what constitutes rational pricing. 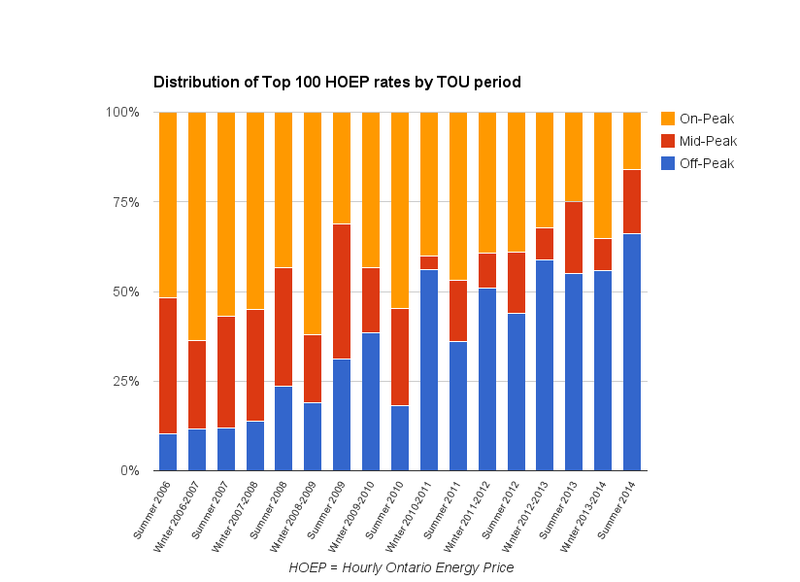 The shifting in the TOU distribution of hours in which the top 100 HOEP rates occur has changed more radically than the distribution of top demand hours. 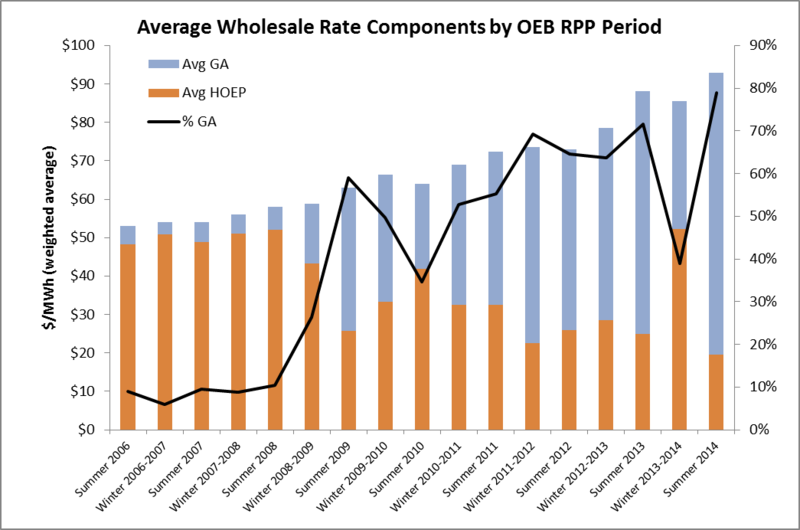 For pricing we've seen a huge jump in the number of Off'-Peak rate hours with very high rates. There was a jump in the trend when Off-Peak was lowered to 7 PM, but the trend existed before that change,and continues after that change. Real-time pricing (RTP) is a far better alternative to TOU pricing for systems with variable intermittent supply from wind and solar generators, but it's alos one that requires a different data infrastructure than Ontario's feable construct to support TOU billing. The data work resulting in the charts, and arguments, presented is extensive, and I find that somewhat unfortunate as what is happening was the only thing that could happen with time-of-use rates being introduced along with procuring much greater supply from variable intermittent electricity generators. I wrote Smartiness: Smart Meters and Smart Grids Without Smarts over four years ago. Since then I've learned, and written, quite a lot on the subject. I was pleased to see the astute report from Ontario's Auditor General, and disappointed to see the poor quality of the criticisms of her work. Hopefully this work of mine provide her supporters some information to fight the uninformed slander that rewarded her good work, and if I provide some slanderers good material to hurl at uniformed apologists of the wasteful spending that will at least be something. For myself, I've reinforced my position that any effort towards billing on time-of-use is a poor use-of-time.